One of best snacks I have ever tasted. 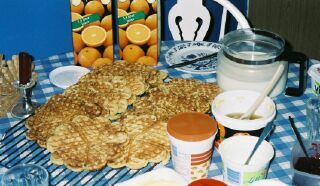 My host mother could make delicious waffles, which we normally topped with jam and sour cream. 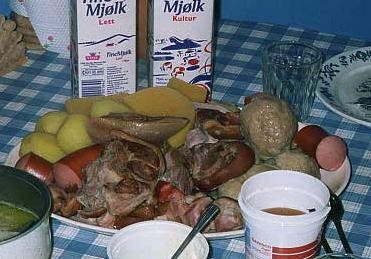 Klubb is a mixed ball of potatoes and flour served with cured meat, pølse (sausage), kålrabi (rutabaga) and topped with syrup. Reke are prawns and often served on white bread, fiskepudding, and topped off with a twist of lemon. Reke can also be made into a very tasty soup! My first real taste of fresh crab! Very good! Kurt went crab fishing one night at the ocean and brought home many crabs. I enjoy this meal very much! 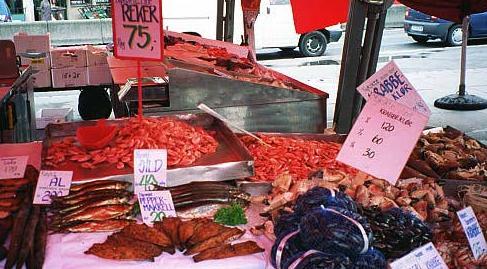 The local fish market in Bergen. Here one can purchse live fish and lobsters from a open tank, or one can purchase fresh salmon with prawns. 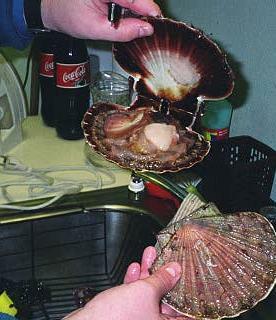 Jørn and I preparing my first taste of scallop. 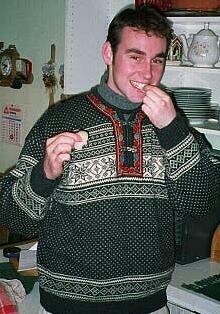 Me tasting my frist scallop raw in a traditional Norwegian sweater. 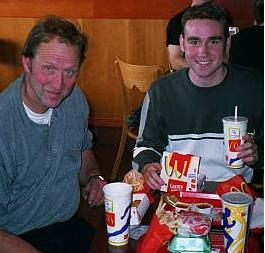 On a trip one day, Jan, Jørn, and I stopped at a McDoanlds to eat. First McDonalds in Norway!!! This is McD's is a three hours drive and is the closest McDonalds. Dinner at a friend's house. The hostess cooked portabela mushrooms, baby carrots, and pasta with chicken in a white sause. Very tasty! 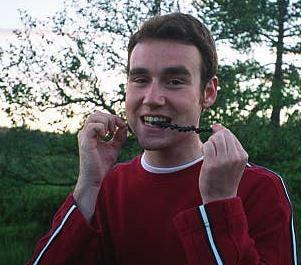 Norwegians go beresk over berries. They love scouring the countryside in search of wild berries, to eat fresh or in jams. The supreme delicacy is molter med krem, arctic cloudberries with cream. 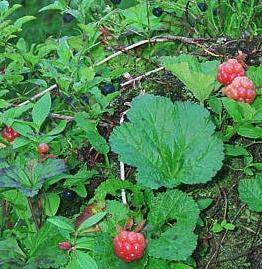 These berries that grow on mountain sides just among the cloubs, hence the name arctic cloudberries. They are orangish-red and have a very unique taste. A Norwegian tradition, while hiking in the mountains, is to pick blueberries and place them on a blade of dried grass. Then eat them off one by one while hiking down. Jan & I caught some fish in a nearby lake one evening. We then brought them home, cleaned, and cooked them. The best tasting fish is the fish you caught yourself! 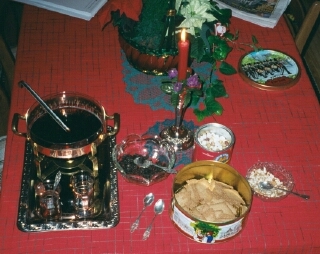 This a traditional Christmas drink, Gløgg. 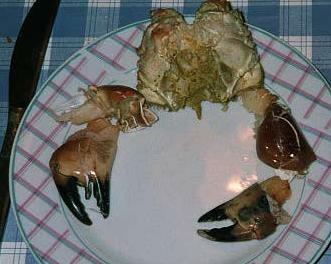 It is served warmed with crused almonds, raisins, nuts, and mixed with redwine. It smells of Christmas! 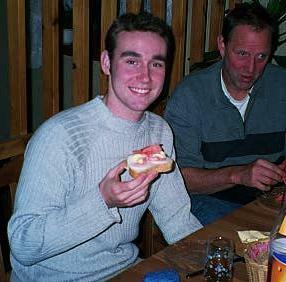 We drank it the day before Christmas Eve at my host-grandmother's home with spice bread. Christmas in Norway is celebrated after 5 o'clock, when the church bells ring all over the country, on Christmas Eve. My family had a traditional meal of cured (salted) rib of lamb before exchanging gifts, all on Christmas Eve. In the old times, Christmas lasted 20 days, but now it ends on New Years. This is a photo of our Christmas food, "ribbe." It is salted rib of lamb and tastes so good. 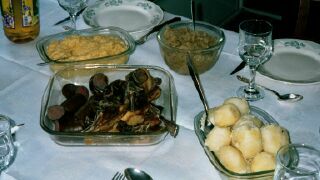 It is served with potatoes, rutabaga, and sauage.